Welcome to Marvel Strike Force Minions page. This is the full description of MSF Kree Oracle stats, skills, and abilities. In Marvel Strike Force, Kree Oracle is a Kree minion with decent damage, who buffs his allies. Kree Empire, formerly known as Ruul, extends around the whole Greater Magellanic Cloud with Hala and Kree-Lar as its home planets. Kree Empire is governed by a technologically advanced alien race with militaristic aspirations. The Kree race has physical similarities with the human race although they have blue skin and cannot breathe in Earth's atmosphere. All important decisions and strategic moves are controlled by the Supreme Intelligence, making the Kree Empire a military-technocratic dictatorship. The most notable Kree characters are Captain Marvel, Ronan the Accuser, Korath the Pursuer, Captain Atlas, Doctor Minerva, Shatterstar, Ultimus, and Yon-Rogg. Like other Kree minions, Kree Oracle is a little hard to get and his price is 45 shards obtainable only by premium orbs, raid orbs, raid supplies, and 5-6 Nexus Campaign Mission. Kree Oracle's first skill inflicts medium damage and grants ability energy to his allies. His second skill buffs allies with regeneration, and if allies are Kree they receive 2 Regeneration instead. Also, Kree Oracle has a passive ability which grants healing to all allies who receive additional ability energy (Kree allies receive additional healing). Attack the primary target for 90% damage. 50% chance to generate 1 Ability Energy to 1 random ally. Apply Regeneration to 2-3 allies most injured allies. If those targets are Ronan or a Kree Minion, apply an additional Regeneration. Whenever this character or an ally gains energy, heal them for 100 Health +5% of this character's Max Health. If the target is Ronan or a Kree Minion, heal them for 200 Health and 10% of this character Max Health. 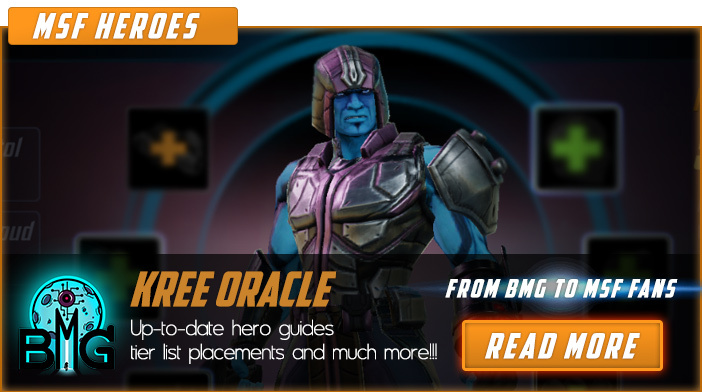 We hope that you enjoyed the description of MSF Minion Kree Oracle. For detailed information about other MSF Characters check our MSF Minions page.